This post features family recipes – Hot Apples Recipe & Summer Tomato Soup – shared by German cookbook author Anne-Katrin. The recipes are her childhood favourites and loved by her children as well. During our trip to Beijing in April 2007 for the Gourmand World Cookbook Awards, Jigyasa and myself met Anne-Katrin Sura, cookbook author from Germany who writes about family recipes. She holds a degree in romance languages and literature, was raised in Brussels, the home town of the European Union. She has traveled a lot and all the different styles of European and more exotic cooking are familiar to her. In 2005 she and her four children settled in Koenigstein, near Frankfurt. Her cuisine encompasses some of the best recipes Europe’s cuisine has to offer. Anne-Katrin loves to entertain her friends and family and besides being an excellent host, she teaches children and grown-ups the art of cooking. 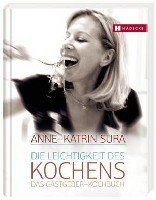 Her award winning cookbook titled “Die Leichtigkeit des Kochens:The Lightness of Cooking – A Host’s Cookbook” was published by Haedecke in 2006. 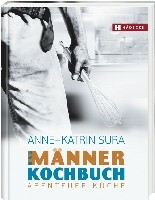 Her second cookbook titled “Das Männerkochbuch: A Men’s Cookbook – Adventure in the Kitchen” published by Haedecke in 2007 is a best-seller. Then Knesebeck published her “Fit for Cooking” – the ultimate kitchen training shows the importance of a functioning kitchen with all its ingredients to become the perfect “chef”! 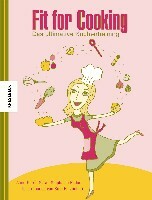 View Anne-Katrin’s cookbooks on amazon! Since she specializes in family recipes, we asked her to share a culinary tribute with us. She promptly replied and sent us these two – Summer Tomato Soup & Hot Apples Recipe. I am sharing some recipes that my mother used to make for us children – when the summer was hotter and the cherries sweeter…made with love and in big amounts ingredients are easy and affordable even on a larger scale) – because we were many and always had other kids around! 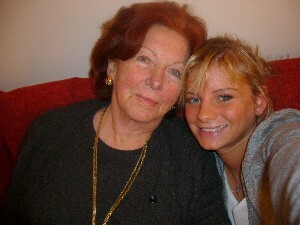 Anne Katrin’s mom with her 20 year old daughter! Summer Tomato Soup – this is how summer tastes! The pure and intensive taste of beautiful, ripe summer tomatoes is so tempting and uniquely intensive, that there are never any left-overs. Slightly stew the chopped onion and whole garlic cloves. Add the tomatoes (cut into small pieces) and cook with pot closed at low temperature for an hour. Put everything through a ricer, add pepper and salt – voila the soup is ready. You can add freshly chopped basil, a tad of fresh cream and roasted croutons. This excellent soup is the perfect addition for every fine dinner. This is a recipe with hot apples and the lovely scent of cinnamon! A classical dessert that we eat more in winter than summer (because it is hot, but goes with almost every menu). Wash the apple and take out carefully the apple core, without breaking the apple. Put some cranberry jelly in the hole, a little bit of butter, some cinnamon and almonds. Preheat the oven and bake the apples at 200°Celsius ind the middle of the oven for approximately 30 minutes. Really yummy with vanilla ice cream!